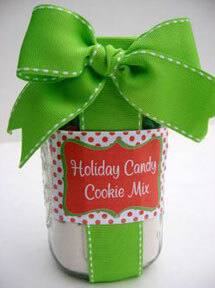 To make cookies, mix jar contents with 1/2 cup melted butter, 1 egg and 1 teaspoon vanilla. Drop by 2 tablespoons on cookie sheet. Bake for 10 minutes at 350 degrees. To give as a gift idea, be sure the lid is on tightly, then print off labels on sticker paper (Office Max), place label on front of jar, be sure to include cooking directions, and top with a bow.